The 10 Best Places for Paint & Wine in Iowa! Pairing art classes with wine is the perfect way to shake up the usual routine. If you happen to be located in the state of Iowa, or just traveling through, spread across the state are studios and venues happy to host a night of paint and wine. 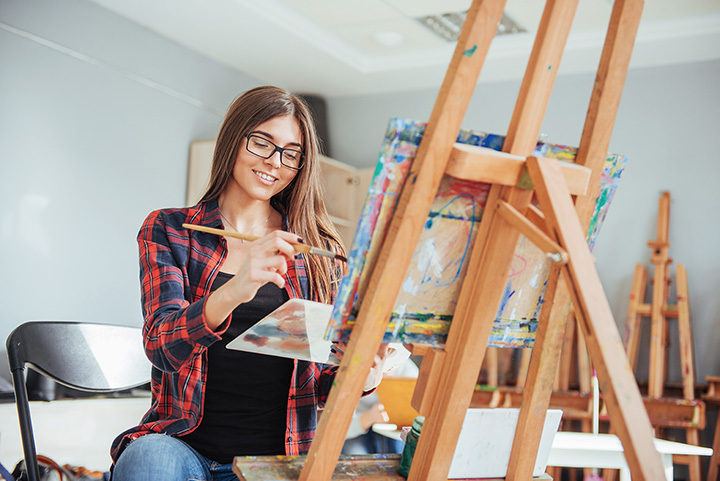 While all the locations vary in ambience and what painting you’ll recreate, the common factor that ties the 10 best places to do paint and wine in Iowa is that they all welcome every level of painter, and that you’ll have a fun time as you explore your artistic side. Known for its social painting experience, Brush & Barrel in Coralville is a storefront meeting spot for the artistically inclined adults looking for a good time. You don’t have to be Monet to enjoy Brush & Barrel however, and you don’t even have to have any experience at all before your first visit, because the Brush & Barrel philosophy is one of inclusivity for all interested painters. Outside of booking a private party, Brush & Barrel offers weekly events with different canvasses to create, which can easily be viewed and signed up for via their website. An undoubtedly perfect spot to uncork and unwind, Cedar Valley Art & Wine in Cedar Falls provides everything but your favorite BYOB choice of drink. Whether you choose wine, beer or even a water bottle, be prepared to share some good cheers with fellow painters on any one of the many nights Cedar Valley Art & Wine hosts the entertainment. You can find the Cedar Valley Art & Wine calendar two months ahead of time on their website, which also provides the template from which you’ll recreate your own masterpiece on your next visit. If you’re ever in the neighborhood of Sioux City, it’s well worth your time to check out the locally-owned, small business of Poppin’ Bottles n’ Brushes in the Indian Hills Shopping Plaza. Whether your visit consists of a private party with you and your friends, or one of the weekly events painting alongside many soon-to-be friends, you’ll get the same experience at Poppin’ Bottles, which includes personal instruction by a local artist, a sociable time between the paint strokes and a final product that you can take home with you to hang on the wall. Believing in the beauty that is friends and strangers gathering to paint and give good cheers, Vino Van Gogh hosts events at local business around the northeast of Iowa. Currently, the main area of attraction for Vino Van Gogh is Cedar Rapids, but they also host many events in Solon, Marion and Coralville. Each week and each location brings a new artist to the party to help you along on your own masterpieces, and with wine and food available for purchase at most locations, you can be sure to have all the supplies you need to have a good time. The secret is out in Swisher, and the Secret Cellar’s Bordeaux and Brushes wine tasting and painting events are some of the best you’ll find in the state. Not only does the backdrop of The Secret Cellar lend to beautiful artwork, but the well-stocked inventory of this wine cellar and supplier can keep you easily entertained no matter the level of your artistry. The Secret Cellar doesn’t stop with the paint strokes either, and you can find wine tasting parties, wine and waltz social events and a wine tasting club to compliment your visit very nicely. Cork N Canvas doesn’t have a dedicated studio spot for their paint and wine social events, instead they utilize the already ambient decor of Eastern Iowa locations like bars, restaurants, wineries and anywhere you want when you book a private party. While the bars and restaurants provide the ambience for a social time, Cork N Canvas provides everything else including the art supplies and instructor, and all you need to bring is a willingness to give it a try, whether that means painting or a new bottle of wine. Alongside their multiple painting classes a week, the Rustic Corner in Charles City is just a cool place to hang out. With a spacious, two-story building, the Rustic Corner also a collection of home decor to peruse, and women’s fashion lines to add a new outfit to your visit. Besides just being a fun spot to be at, the Rustic Corner’s painting classes have the reputation of being some of the most enjoyable in the state, regardless of how much skill you bring to the table. Pinot’s Palette of Des Moines provides the instructor, art supplies and comfortable vibe, and all you need to bring is a friend or two and your favorite bottle of wine. This BYOB painting studio is true highlight that hangs on the wall for many Des Moines residents, and whether you are a permanent dweller of Des Moines or just visiting, Pinot’s Palette will have you reconnecting with new and old friends while touching in with your artistic side. Canvass, colors and cocktails, that’s the motto for Re-cre8 Studio in Davenport, and whether you consider yourself a seasoned painter or you’ve never dabbed a paintbrush on the canvas, Re-cre8 welcomes you and whatever beverage you go for. Fun for the whole family or private events, Re-Cre8 hosts a great place to gather and give some color to your usual routine. To see a gallery of their upcoming painting events, be sure to check out the Re-Cre8 website and sign up today. Originally founded in 2012, Creative Spirits has grown over the years and operates studios in Ames, Okoboji, Sioux Falls, Forest City and up north in Minnesota. The reason for this rapid expansion isn’t from selling masterpieces of art, but it comes from the dedicated good time that Creative Spirits provides for all patrons of the paintbrush. Check one of the classes out for yourself and you can bring something home to show for it.